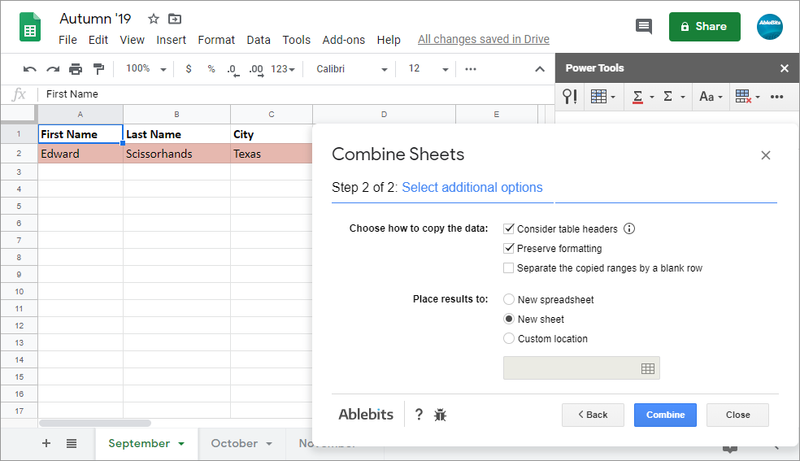 This add-on consolidates data from many spreadsheets into one without copy-pasting. Even if your tables differ in formatting, column order, or contents, Combine Sheets will join everything you have in one table using the column headers. You dictate the tool what sheets to compare, what to do with formatting, and where to put the results in two steps. Combine as many spreadsheets as you need As long as you don't exceed the Google limit for 5 million cells. Adjust the ranges to merge Go with the entire sheet or select a particular range manually. 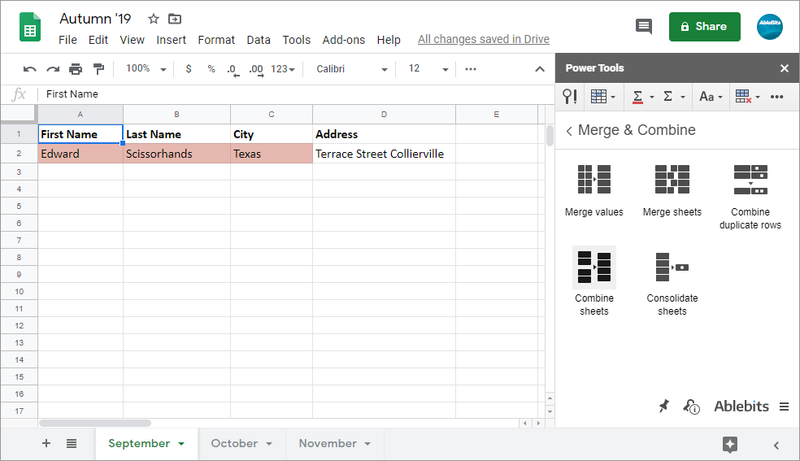 Merge spreadsheets based on column headers No need to have tables of the same structure - the add-on detects common columns. 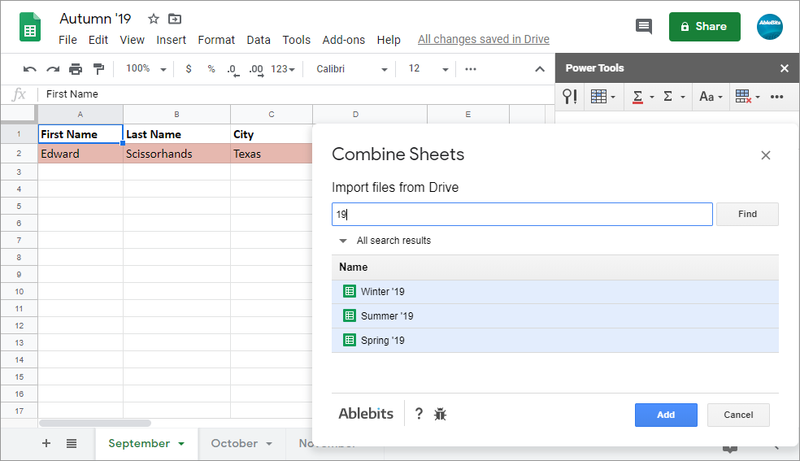 Select spreadsheets from Google Drive Use the quick search to find and add the sheet without opening it. Preserve the formatting of the tables Transfer each dataset with its original formatting. Choose a place for the resulting table Review the result in a new spreadsheet, extra sheet, or a range of your choice. What is Combine Sheets and what do I need it for? Our add-on is designed to quickly gather the data from multiple sheets at one place. 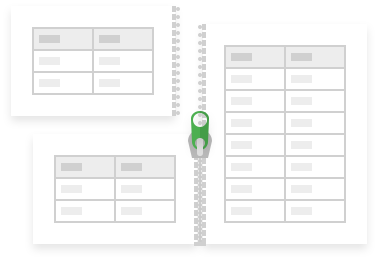 It merges spreadsheets no matter their formats and contents and builds all records into a well-constructed table. The tool recognizes the same columns and joins them together if necessary. For a better review, you can choose to add an empty row between the datasets that belong to different files. What's more, you decide whether you want to transfer not only the data, but also its original formatting. I think I can transfer ranges without any add-ons, can't I? Yes, but it won't be easy. One way is to copy-paste the tables between sheets manually. You may agree that it's hardly convenient when you need to combine data from multiple sheets into one sheet. Another way is to use the IMPORTRANGE Google Sheets function. But for a proper reference, you'll have to open each spreadsheet and retrieve its URL, sheet name, and the exact range. The formula, however, won't preserve source formatting; neither will it apply the existent format from the current sheet. Also, for each new range it will ask for your permission to connect sheets. It's much easier with our tool. You just tick off the sheets to join, decide on saving formatting, choose a place for the result, and voila! - the tables are brought together. 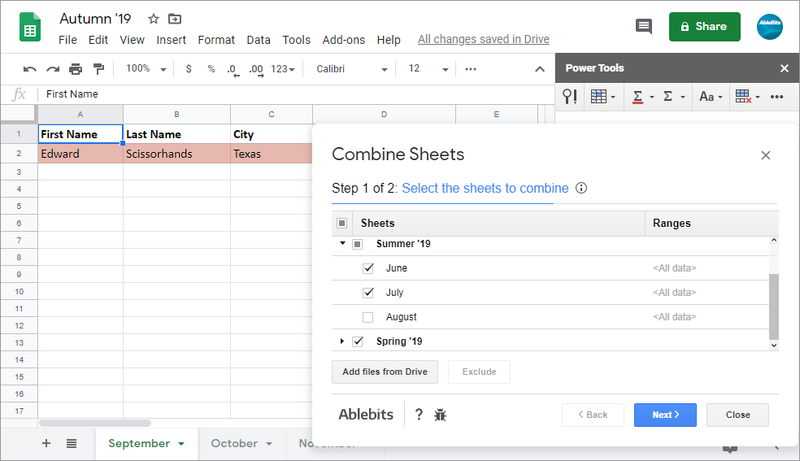 So how do I combine Google sheets? 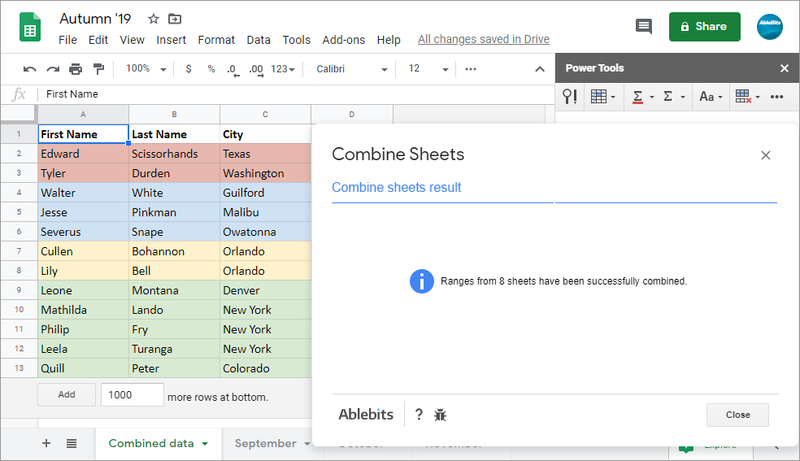 Select those sheets or entire spreadsheets you want to consolidate. Add extra files from Google Drive if necessary. Adjust a couple of settings to your needs. The columns in my tables differ in order and quantity. How will your add-on process them? There's no need to prepare the data beforehand since the order of the columns is not important. Combine Sheets places the values from identically named columns into one. Other columns are added to the same table, allowing the add-on to create a single powerful summary table out of the scattered data. Will my tables lose all the formatting after the merge? No, a special extra option lets you bring the formatting of each dataset along with the values. How many sheets can I combine with your add-on? As many as you need - just consider Google Sheets limit for 5 million cells.